-The following is reprinted from a February interview profile done by Sherry Blue Sky for Poet’s United. Oh, we have a wonderful feature for you this week, my friends. Buckle up, as this time we’re flying cross-country to the beautiful Blue Ridge Mountains of Virginia. The song is running through my mind as I type. We’re going to pop in on the talented Colleen Redman, who writes at Loose Leaf Notes, a wonderful mix of poetry, prose, photos, and incidents from her jam-packed-with-fun life. I am so looking forward to this! Let’s hop aboard. Keep an eye out for the peaks! Sherry: Wow, Colleen, looking through your site to prepare for this interview, I got such a glimpse of the rich, eclectic life you live, your beautiful surroundings, and the way cool people you live with, and among. Give us a peek in, if you will. Tell us about the beauties of living in the Blue Ridge Mountains of Virginia. Colleen: In Floyd, we have homebirth, homeschool, homegrown, and homemade. I guess I fit in pretty well here, since I’m a homebody. I live with my husband Joe in a cabin off the scenic Blue Ridge Parkway in Floyd County, VA. Floyd is a rural county known for its mountain culture, traditional music, small farm homesteads and a flourishing art scene. The Friday Night Jamboree at the Floyd Country Store and Floydfest music festival are world renowned. Sherry: I love your cabin! It all looks and sounds wonderful! I love small, alternative-energy towns. I spent my happiest years in just such a one. I raised two sons in Floyd and now have two grandsons, who live down the mountain in Roanoke and who I regularly help care for. Before having children, I worked as a day care teacher. I’ve held a number of jobs in Floyd, including making and selling my own jewelry, working in my friend’s bead shop and providing foster care for an adult with disabilities (for 8 years). For years, I taught a creative writing class at Floyd’s independent Blue Mountain School, where my sons went when they were young. Sherry: Sigh. What a wonderfully rich and fulfilling life you lead! Colleen: Today I contract with the local newspaper on a part-time basis, covering events and contributing photos and feature stories. My husband is a licensed counselor and co-founder of a project-based high school here in Floyd. For seven years I was a member of the Floyd Writer’s Circle (a writer’s workshop group). We hosted a popular Spoken Word Open Mic monthly night at a local café that also lasted for seven years. We have two excellent literary journals based out of Floyd – Floyd County Moonshine and Artemis Journal – that have featured my poetry. Sherry: A culturally rich existence. You could not find a better setting for a writer. Now let’s go back. Tell us about your childhood, and where you grew up. Did you begin writing as a child? Is there something you feel, looking back, had a significant impact on your becoming a writer? Colleen: I grew up in the South Shore of Boston, MA, in an Irish Catholic working class family of nine siblings. I’ve always maintained that jump rope jingles, nursery rhymes, and the songs from the 40’s that my father taught me were some of the early influences that contributed to my love of language, rhythm, and word play. I also attribute my Irish heritage as an influence in my poetry, and my inclination towards small poems (about limerick in size). The Irish side of my family is rich with storytellers; some poems and a song have been published, and there are a few unpublished novels still floating around. In high school, I always liked composition more than True and False test questions, and language far more than math. I liked history that gave insight into how people behaved and how the world works far more than trying to memorize battle dates and state capitals. I wasn’t awakened to writing while in school, but was later inspired by the lyrics of the music of my generation (Joni Mitchell, Bob Dylan etc.) While working at a hip boutique in Boston in 1969, I distinctly remember hearing Leonard Cohen singing “Suzanne” on the radio and thinking that I wanted to be a poet. Sherry: A defining moment, that began a wonderful poetic journey. Colleen: As a fledging poet, I recognized my poetic line in the work of Richard Brautigan and the performance art poetry of Yoko Ono. My influences range from Rumi to Erma Brombeck, a humorist/columnist who I recognized as a teenager as someone who had something to teach me. The fact that I’ve plugged away for all these years, spending countless hours fiddling with poems without much compensation to speak of, is a strong indication that I was made to write. Sherry: Yes, we write because we must. And thank heaven for online, and for having readers willing to read and encourage us! You are talented in both poetry and prose. Which do you love most? And what is it about poetry that keeps you writing it? Colleen: I have said that prose is like my day job and poetry is the rest of my life. Writing poetry has been my writer’s foundation and a good training for developing a sense of structure that can translate into other kinds of writing. Through writing poetry, I learned the importance of opening and concluding lines, sound and rhythm, bridging thoughts together, and creating meaning. I’m good at looking at one thing and seeing how it is like something else, and reading and writing in ways other than from left to right. Ultimately, the technical part of writing can always be worked on, but you can’t invent a voice. My writer’s voice is stream of consciousness language that I can trace back to my childhood. It’s untamed and comes with a level of authority that my other thoughts don’t have. I’ve learned to yield and listen to it. It’s the raw material of writing, that once collected I have to make something of. Sherry: You have said it well. You cannot invent a voice, it comes from within. Colleen: I like the balance of going from the accuracy it takes to document or report, to the freestyle self-expression of poetry. I’ve described writing poetry as taking my psychic blood pressure. I use the pen to get a diagnosis as well as for the treatment. There’s something satisfying in distilling a feeling or thought down to an essence. Sherry: This reminds me of your quote: “A blog is to a writer as a canvas is to an artist.” I believe you are right. Smiles. When did you come to the world of blogging, and how has that impacted your work? Colleen: I had been writing a lot of political commentary – especially during the U.S. invasion into Iraq – for the Roanoke Times, Common Dreams, our local Free Press and other publications, but I got burned out doing that. Ready to turn over a new leaf, I wanted to have more fun with writing. So, I posted a photo of me in Ireland with a shamrock pinned to my sweater, drew on my Irish storyteller roots and started my blog, Loose Leaf Notes, in 2005. Blogging has given me a forum and an incentive to keep writing. I like the directness and self-sufficiency of not having to submit work or look for publishers. It’s like having my own magazine that I can post to every day, a poem, a photograph, a commentary, a formal or informal piece of writing. I also reprint my published print features, which gives them a longer shelf life. I like the inter-active aspect of blogging and through blogging I’ve made virtual friends from all over the world. Sherry: I love that, too. I never would have dreamed anyone outside my family and friends would ever read my poems. Or that I’d meet such a talented and diverse community of poets the world over. It is a gift I never take for granted. Colleen: One of my favorite things about blogging is that it acts as a writer’s filing cabinet. I can access everything I’ve written by searching a word or clicking on a category or date. Blogging is a good form of documentation that allows me to organize and cross reference my work. My blog can be personal, but I think of it more as universal. I believe that writers have been sharing the personal in print novels, non-fiction or poetry since the beginning of the written word and that blogging is just another writer’s medium. I always keep in mind what Robert Frost said ‘all the fun is in how you say a thing’ and that each blog entry posted is a published document. I do my best to make sure I can stand behind it. Sherry: Well said, Colleen. I read on your blog that you have a chapbook titled “Packing a Suitcase for the Afterlife” (great title! ), and that you are seeking a publisher . Good luck, and keep us posted, wont you? How does it feel, to have a book completed and ready for print? What are your thoughts about the differences between being published by a publishing company or self-publishing? Sherry: Colleen, I am so sorry. I cannot imagine going through the loss of two siblings within a month. I am so glad you wrote your way through. Colleen: The book was used for years in a grief and loss class for counselors at Radford University, where I was a yearly guest speaker. Three runs of 350 copies were printed at a local publishing company, and I sold all but about half-a-dozen of them before the book went “out of print.” Writing a book was a leap that taught me that the more you do what you were made for, the more it grows in you. I invested the proceeds from The Jim and Dan Stories into a 2004 printing of Muses Like Moonlight, a collection of poems and essays about writing, and I still have copies of that. Sherry: Your poems are asking the best questions! I look forward to reading more of your musings. I love the poem “I Look Up,” and I would love to include it here, if you agree. It really speaks to me. It sounds as if it was written for someone very dear. Colleen: “I Look Up” was written this past December for my sister Kathy who died from cancer in November. After going to her funeral, and once I got back into my own home routine, it was the first poem I wrote that tapped into another layer of grief and provided an opening for me to have a deep cry. Sherry: So moving and poignant, Colleen. You have learned much about grief and loss. I am glad you are sharing that with us and with others. Would you choose three of your poems to include here, and give us your thoughts about each one? Colleen: The first poem I’m sharing – “In Answer to ‘How Are You?’” – was written after reading a Facebook update from a young woman I know who has a life threatening condition. She was explaining to friends how hard it is to answer the every day question, ‘how are you?’ I’ve always had trouble answering that question. It’s so general and I’m not one for rote answers. Also, I have been living with a variety of Chronic Fatigue Syndrome (CFS) for a few decades and some of the standard answers, like ‘great,’ usually don’t apply to me. Sherry: I love these responses to the rote question! I might try this. Also, I have lived with CFS for many years as well, so I understand as only a CFS-er can. Colleen: “I Put You on Speaker Phone” was published in Floyd County Moonshine. It was written about an exchange I had with my mother, who currently lives in a nursing home. After talking with me on the phone, she wasn’t physically able to hang up. We ended up spending about an hour in silence. It fed me in a meaningful way through the distance and because I knew any exchange we have could be our last. I found myself as the child who wanted her presence and to have some control over that. and do you know which one I am? What kind of voodoo is this? Sherry: So moving, Colleen. Truly, this is the stuff of life. Your work really resonates with the human condition, as we live our daily lives through these amazing and important passages. I can’t wait to read the next one. Colleen: “The Collector,” is a morning poem about attuning oneself to quiet reflection and the ebb and flow of natural cycles. It was published in the 2014 Artemis Journal, which was dedicated to and featured poet Nikki Giovanni. I wrote about the journal re-launch, in which Nikki spoke, here. Nikki teaches at Virginia Tech, not far from where I live, and I audited some of her classes years ago. Sherry: Sheer beauty! Such lovely visuals: the melody of morning, the rosary of silence. Gorgeous writing, Colleen! What other activities are you involved in when you aren’t writing? Do you have other creative outlets? Colleen: I’m a child of the ’60s and have always loved to dance. I’m happy to say that I live in a town where there is great music and I can dance on a regular basis, as I did as a young woman in my peninsula beach town at The Surf Ballroom. I love taking pictures and never go out without my camera and without expecting to be delighted by something that catches my eye. I cover events for our local paper on a part time basis and blog about life in Floyd. I like to garden. Lately, I’ve been exploring my inner life through solitude, poetry and a women’s dialogue circle that I belong to. Spending quality time with my grandsons always puts a smile on my face. I like traveling with my husband. The last trip we took was to the French Quarter in New Orleans (with bicycles). Sherry: You have a beautiful life and family, Colleen. Is there a cause you are passionate about? What concerns you the most, about this old world of ours? Colleen: My writing has never been removed from the rest of my life and has almost always been directly related to issues close to my heart. Whether it’s writing political commentary against the Iraq War, starting a Caesarean Prevention newsletter with a friend, or The Bell: A Call to Peace newsletter with another friend, I write to synthesize what I’m learning at the time. The majority of my writer’s training ground took place within the pages of A Museletter, a homespun community newsletter that was cut, laid out, pasted, and collated by volunteers from the Floyd alternative community every month for more than two decades. I first began writing for and co-editing the Museletter when I moved to Floyd in 1986. In the early days I wrote a monthly home-schooling column, but soon my subjects branched out to include those on gardening, herbs, self-health, woman’s issues, environmental issues and travelogues. I use to refer to the Museletter as “kitchen table democracy.” My poetry contributions were a mainstay within its pages. Today, I like to spotlight the talents of others and have written many feature profiles for our local newspaper. I’m a documenter at heart, feeling that our stories are what endure after we’re gone, so we might as well set the record straight. I like to touch on our human commonality and tell the back story of life. When I’m writing a story about someone, I’m not looking to know what they don’t want to tell me, but I am interested in the inner life that drives their outer story. In 2015, I contributed an essay to a locally published book called Floyd Folks: Collective Wisdom from a (One Stoplight) Mountain Community. In it I talk about “Living My Version of a Successful and Happy Life,” as well as my long standing struggle with CFS. I summarize what I believe to be my best contribution to the world: “Just as I could fill notebook pages on the alternative supplements and therapies I’ve tried over the years to overcome CFS, I could also fill pages on the workshops I’ve taken, self-help books I’ve read, practices I’ve undertaken and progressive thought I’ve explored over the years. Sherry: Your life wisdom informs your writing, my friend. Is there anything you’d like to say to Poets United? Colleen: I look forward to sharing poetry with Poets United poets via our mutual blogs and reading their comments. It’s been my experience that poets write the best comments on the internet. Sherry: Thank you so much, Colleen, for allowing us to get to know you better. We are happy to have you join us at Poets United, and look forward to enjoying your work in the months and hopefully years to come. Well, my friends? I told you we were in for a wonderful visit. As our plane lifts us up and away from the big blue hills, I give a big sigh, not quite ready to leave this beautiful place. Do come back and see who we visit next. Who knows? It might be you! – Visit Poets United HERE. Photos: 1. Colleen in 2015. 2. Our cabin on three acres of land. 3. Our town during the Friday Night Jamboree. 4. My two sons, Josh and Dylan, and two grandsons, Bryce and Liam. 5. Me and my siblings. Boys: Jimmy, Johnny, Joey and Danny. Girls: Sherry, Colleen, Kathy and Tricia. 6. Me reading poetry at Café del Sol in 2007. I blogged about a more recent reading (2014) in Floyd HERE. 7. 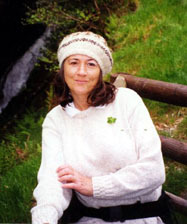 Me in Ireland, 1999. 9. Jim and Dan Stories. 10. Muses Like Moonlight. 11. The Girls. 12. U.S. Senator Tim Kaine playing harmonica at the Floyd Country Store. 13. My husband Joe and our grandsons on the Blue Ridge Parkway, a few minutes from our house. 14. My friend Triona Bason at downtown loft overlooking the town. I wrote a feature story on Triona for the newspaper recently. See HERE. 15. Floyd Folks book. This was so cool and while I knew much of this about you, I was not as knowledgeable about your great writing. Congratulations on the interview as well. You have a rich heritage and life. Thank you, Tabor. You’re words always mean a lot to me. I know this reprint was long but I wanted it stored in my virtual writer’s filing cabinet. I thoroughly enjoyed this. I don’t know anyone else who knows/enjoys Erma’s work and have not heard her mentioned in so long – that was fun info to learn about you. I recall the first time I heard Judy Collins sing Suzanne and being moved very deeply to learn more about the songwriter, Leonard Cohen. It still calls to me to come listen, and I am sure it was the door opener for Cohen as a songwriting force. Your poetry always brings me such pleasure, Colleen. You have lived a very rich life in so many ways. Making choices that allow us to spend our lives pursuing that which we love is perhaps the greatest gift we can give ourselves. 🙂 I am grateful that I have been able to experience just a bit of your rewards via your blog. Thanks for sharing with us. Thank you, Sky. Your comments and readership over the years has been very supportive and is part of what gives me the incentive to keep blogging. I was thinking the other day about that Leonard Cohen moment (remember exactly where I was and how it felt hearing Suzanne for the first time) and remembering how Led Zepplin changed my life in the same way. (Now I’m humming ‘I’m a little bit country and a little bit rock and roll). I’m reading Steven Tyler’s memoir right now (not because I liked Aerosmith but because of the generational rock history, that he was based out of Boston and I have stood 2 feet away from him before). On one page he says “I saw Zepplin at the Tea Party.” I was there too and that was when they changed me. There was nothing like them. Just played Whole Lotta Love and She’s Like a Woman yesterday, remembering listening to them on a transistor radio throughout the night when I still lived at home and was supposed to be sleeping. Reading Erma Brombeck as a teenager showed me that people can make a living out of writing about their lives and she also showed me about mixing humor with writing. I was shocked that it was that easy and fun. so I can wipe my glasses. There’s a pretty girl I want to look at.